copyright © 2014 James J. Hurtak, Ph.D., Ph.D. and Desiree Hurtak, Ph.D. The changes in the rings of Saturn have completely overturned the classical picture of a stable system. The current study of the massive ring system has produced evidence of gravitational resonance, but, more importantly and stunning, is the finding of the “F-ring” having a strangely, continuously changing pattern, from helical formations to propeller-like mini-spokes. 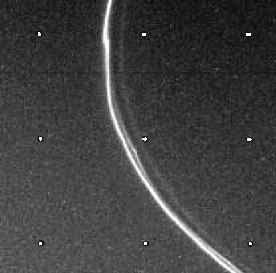 Some scientists even believe that the rings are producing small moonlets from the collisions of fragments that exist in and around the rings, especially the F-ring which exists in the Roche limit, a point where the gravitational tug from the planet could tear a larger moon apart. Again, the rings are made of dusty ice, in the form of boulder-sized and smaller chunks that often collide with each other as they orbit Saturn. Saturn’s gravitational field constantly disrupts these ice chunks, causing, as well as preventing them from forming moons. Saturn, itself, has the most moons of any of the planets in our solar system, over 60 objects of this type, but they are mainly outside the more familiar inner ring system with just a few in the area of the A- and B-rings, more towards the F-ring, but the majority lying in the G- and E-rings and beyond. Another question is the age of the rings. They may be as old as 4.4 billion years, but if they are so old why are they changing so rapidly? Did they always do this or is there something new taking place? This indicates that Saturn holds one of the clues to the next phase of our solar system’s evolutionary future. The first part of this quote was confirmed in the same words by Lika Guhathakurta of NASA headquarters in Washington DC that our sun is “a variable star.” 3 Thinking like that was unheard of before 2010 when observations of variations in the sun’s magnetic field were noted by NASA. Additionally, some research scientists (e.g., MGS MOC Release No. MOC2-297, 6 December 2001) have recently considered that Mars itself is going through climate change.4 So all planets may be experiencing some changes, it may just be more obvious within Saturn’s rings and possibly the polar regions of Mars. It is fortunate that we have a 30-year comparison made by Voyager (1980-81) from colleagues at JPL and the team of Dr. Jim Warwick in Colorado. So why are the rings revolving and changing into strange patterns? Theories still abound. The answer to these deeper questions may lie in the nature of the outer planets and especially how the rings themselves seem to have rain affecting Saturn’s ionosphere.5 Saturn’s moon Rhea may also have rings around it, although this has not been confirmed. The rings of Saturn themselves although varying in width are incredibly thin, ranging from about 30 feet (10 meters) to several kilometers thick at most. The rings have slight pink, grey and brown colors due to the presence of dusty material mixed with the water ice. A definite change in the appearance of the rings is at work. Whatever the result of the new research, keep looking upward for we are about to learn more valuable information about how Saturn’s rings, as well as how its planets and moons, are forming and evolving as a miniature solar system. 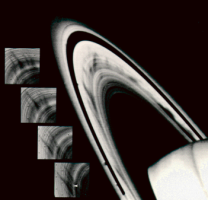 “Origin and Evolution of Saturn’s Ring System” Chapter 17 of the book Saturn After Cassini-Huygens pp. 537-575. P.O. Box 206, Hekpoort, 1790, Gauteng, SA.